The Short Boxed Beard is an alternative to the Full Beard for those who aren’t quite ready to commit to the mountain man look. Because it relies on your beard’s natural shape, it can complement any face from angular and oval to heart-shaped and round. Shave away the stray whiskers from the less dense areas of your cheeks. This will highlight cheekbones and other bone structure. 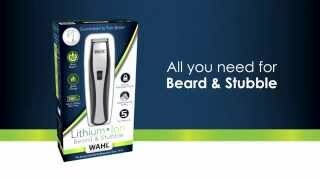 Using the natural borders of your beard growth as a guide, use your Wahl® trimmer to create a sloping border from your sideburn to the mustache. The key is to remove as few whiskers as possible to keep regular maintenance to a minimum. Repeat this step on the other side of your face. Try to maintain a balance between both sides of your face so the beard appears symmetrical. 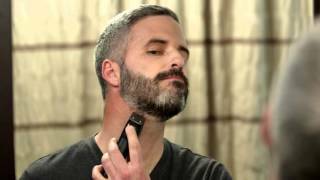 To create a lower border, allow the beard to grow about one to two inches beneath your jawbone and remove any hair below that line with your trimmer. You can create a more natural-looking line by trimming the hair along the border a bit shorter to blend away the strong line. Use your trimmer two to three times a week to maintain the borders and length. The color and density of your beard will determine its ideal length. Trimming to a quarter of an inch is a good start. Dark beards tend to look fuller than light whiskers. If your beard is blonde or red, allow it to grow a little longer to appear full and filled-in.